3008, HUBCAP USED, 14", 67, CHEVY, PASSENGER, CAPRICE, (EXCEPT IMPALA SS), CHROME OUTER RING, DISHED WITH 3 SETS OF RIBS, GOLD & BLACK LOGO IN CENTER. METAL CLIPS. 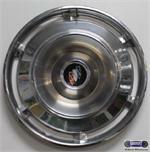 72-76-1 MOPAR, CENTER CAP USED, PLYMOUTH, DODGE, BARRACUDA, CHARGER, CHALLENGER, ROADRUNNER, BIG BOLT, ALL METAL, CHROME OUTER RING, DARK TEXTURED, DISH TYPE WITH RAISED, ROUND CENTER, MACHINED WITH NO LOGO, HELD ON BY 5 SCREWS NOT INCLUDED, 7-1/4" DIA. 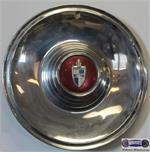 A-5, HUBCAP USED, 15", 61, BUICK, EXCEPT ELECTRA 225, CHROME, 6 SLOT, DISH CENTER, WITH BLACK & RED, WHITE & BLUE LOGO, METAL CLIPS.